Liothyronine - a synthetic thyroid hormone, laevorotatory isomer triiodothyronine (T3). Levothyroxine - a synthetic thyroid hormone, levorotatory isomer of thyroxine (T4). 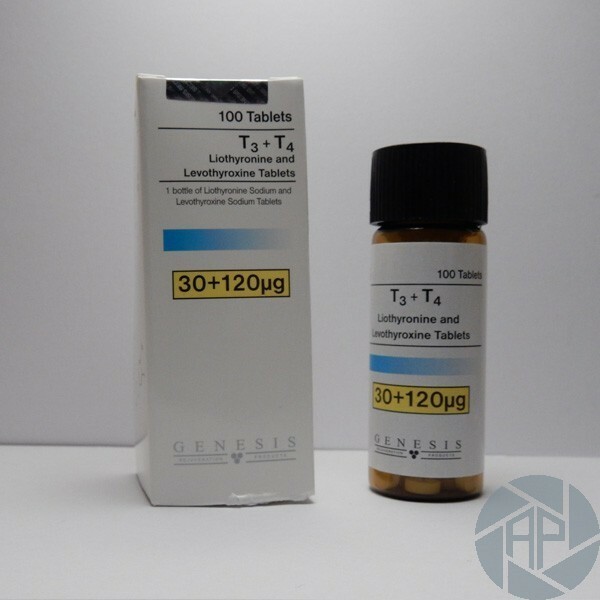 T3 + T4 tablets genesis (30 + 120mcg/tab) - a complex of hormones thyroxine and triiodothyronine Genesis of the Polish company, which enjoys great popularity among athletes. How can be the hormones produced by the thyroid gland for sports related? As research and experiments athletes, such tablets have excellent properties for those who want control of their weight and metabolism tuning. Thyroid much research has begun: the late nineteenth century, have been extensively studied their characteristics and performance. Later, in 1915, one hormone thyroxine opened, and in 40-s of the twentieth century, American scientists at the Chalmers family, along with his colleagues, managed to synthesize their physiological form, and after a couple of years to open and triiodothyronine as a derivative. As it turned out, the T3 + T4 tablets genesis correct dose of T3 + T4 tablets genesis (levothyroxine liothyronine +) and strict compliance with the application instructions helps to work accurately with the weight and influence on metabolism. Driving the action is quite simple: the drug increases levels of hormones thyroxine and triiodothyronine in the body, while at the same time, the body adapts to the occurrence of hyperthyroidism (excessive levels of these hormones) and follows the natural increase metabolic rate. T3 + T4 tablets genesis receiving the right price T3 + T4 tablets tablets Genesis - is the acceleration of metabolism in the 1.6-2 times! Explain the value of this effect for those who are actively involved in the development of its wholly unnecessary body. It should be noted that these hormones effects on the body are closely related and only one of them may not have the desired effect. Passing a course of receipt of T3 + T4 production of Genesis hormones, do not constantly attack the side effects, since the composition of the funds is balanced and does not cause irreversible effects on the body but skillfully uses his characteristics. Thyroxine in the thyroid gland is produced in very small quantities, but under the influence of a group of enzymes specially designed to become a more active form - triiodothyronine. The preparation includes both components in the active form, so to quickly expel the weight and improve digestion of proteins, which lead into the muscle. Athletes interested in different sports this preparation, share opinions, and give advice on proper use. The popularity of this hormone provides cost an average of one pack is enough for a course lasting approximately 4-7 weeks. Therefore, the drug is perfect for both experienced athletes and for those who have just started their way into the security guys and do not want to spend extra money. Analogs T3 + T4 (not only from Genesis) is hard to find on the open market, so that athletes prefer to make a purchase in a secure store, mr-steroid.com. Many have seen the effectiveness of the pills, which can make you! How to take T3 + T4 Genesis? It is necessary to book immediately, the huge and uncontrolled intake of the drug will not have the desired in terms of improving metabolism effect and can cause serious health damage. The rough outline of how to T3 + T4 (levothyroxine Liothyronine) is as follows (excluding additional drugs, which are discussed below): the first week should be taken approximately 25 mg 2 times a day. This approach will allow the body to get used to and adapt. In fact, how to make the production of T3 + T4 Genesis, the important thing to remember about gradually. By the fourth week, gradually increase the reception level of 150-200 mcg per day. In the last week of gradually reducing the dose level - give the body to download, without sudden jumps. The use of T3 + T4 Genesis and the like, it is necessary to carry out intermittently. That is, if you are the lack of effect - hold the result and be sure to make a break between courses of about a month. The endocrine system, "download" and you can start the next cycle of administration. And you can take the tablets in combination with other drugs. Therefore, many athletes should be combined every 25 micrograms of the drug yohimbine from 5-10 mg and 40 mg of clenbuterol. This will cause (for synergy) pronounced fat-burning effect. A similar method is permissible substances once for 2-5 days. If there is fever, it is necessary to take 1-2 mg and ketotifen, and to reduce the burden on the heart muscle must be parallel to take beta-blockers such as metoprolol. The impact of hormones in the body often accompanies the manifestation of side effects. About what one can expect an athlete, and will be discussed later. Let's start with contraindications: the preparation is not necessary to use only the category of people who have severe abnormalities in the endocrine system and the heart muscle. In other respects, the pre-course best to consult with doctors and weight loss safely start the cycle. It is this versatility and offers the most enthusiastic about the products between different dieters criticism, and not only. negative manifestations of hormones that are usually mild and easily wiped out with simple drugs provided great popularity and positive feedback from athletes, not just domestic. In order to ensure a high efficiency when burned fat is sufficient to read the history of the use of experienced athletes in our forum.